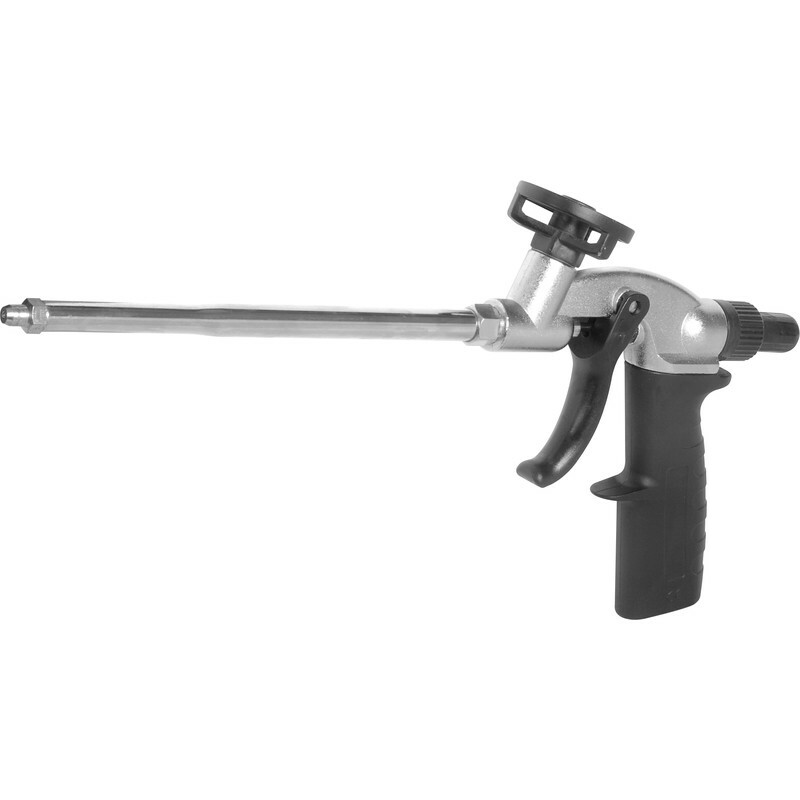 Trade Applicator Foam Gun is rated 4.0 out of 5 by 8. Rated 5 out of 5 by JockyB from Does what it is supposed to do. You need a foam gun. This one is inexpensive and it works. It has already paid for itself in half cans of foam not gone to landfill and there is no comparison between single use cans and a gun in ease and accuracy of use. It makes clean - up much easier, too. Four stars because there are better guns, but five stars for value! Rated 4 out of 5 by AAndyman from Easy to control Easy to use and gives an even controllable disposition. Be sure to keep clean after use with the gun cleaner and don't let a build up of foam form on the nozzle. A bit pricey but much better than using a silicone gun. Rated 2 out of 5 by Ric9 from Probably works, but it's going to be returned Having looked at this in person and compared with the 'Professional' gun, this one is going back. No doubt it would work okay and came with detailed instructions, but I was dubious about how long the bracket that screws onto the can itself will last. If you look at the photo, you can see that there are only three ?cast alloy spokes that hold the large ring into which the can screws - in use, the weight of a can hangs from this and leverage must be substantial. I decided it was better to pay a bit more and buy something that might last longer, so this will be returned. Rated 5 out of 5 by Taml from Gap filler gun Excellent tool as long as the cleaning aerosol is bought at the same time. In my opinion the cleaner should come along with the gun.